Land at Geneva Cointrin airport, in the luxury of your private jet charter, and gaze across the snowy peaks of the Alps. The Swiss city of Geneva is situated at the southern tip of Lac Leman (Lake Geneva), surrounded by the Alps and Jura mountains. Visit one of the most famous landmarks of the beautiful city of Geneva, one of the largest fountains in the world. The Jet d’Eau is a must see spot for the avid tourist. If you are looking to enjoy your time and spend every minute wisely, whilst revelling in all that is offered, head over to the point where the expansive Lake Geneva flows in to the Rhône. Climb down a stone jetty on the left of the lake and fixate your eyes on the explosion of frothing water. As five hundred litres per second are jetted 140 metres in to the air, at any given time there is around 7,000 litres of water in the air. Although, if the wind changes direction, you may be drenched with water, so bring an umbrella! Located in the heart of Geneva’s Old Town, St Pierre Cathedral is a striking structure, which welcomes anyone to experience its humble splendour. Wander gently around the main interior and allow the musky aroma to envelop your nostrils, whilst you admire the high ceilings and simplistic décor. For unparalleled views of the city, climb up a few flights of stairs to the top of the two spires of St Pierre Cathedral. 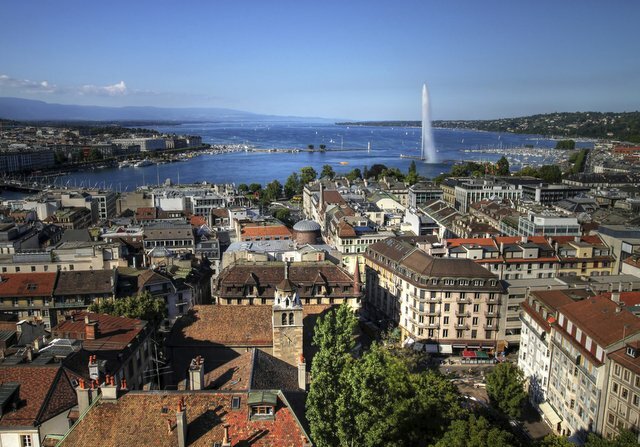 Be astounded and stunned by the 360-degree view of Geneva and the encircling mountains from either tower. You can see Jet d’Eau exploding before your eyes, as the rest of Geneva provides an unmatched vista. Amble through the antiquated labyrinth of cobbled streets that line Geneva’s Old Town (Vieille Ville). Adorned with cosy cafes, restaurants are in abundance; museums and galleries litter the mazes of tiny streets. You will be surrounded by history as you navigate through the muddle of cobbles and the oldest house in Geneva lies within this network of relics. Maison Tavel’s multiple floors have been transformed in to the Museum of Geneva, with exhibits, artefacts, and history filling the beautiful space. One street away from Rue Hotel de Ville, the location of Maison Tavel, is the oldest part of Geneva. If you are thrilled by the exciting history of the city, be sure to visit Place Du Bourg-de-Four. Place Du Bourg-de-Four is a beautiful square, with shops and cafes aplenty; the centre is decorated with marble fountains. Appreciate the modest beauty and soak up the authentic ambience as you lounge at one of the sought after seats in one of the café’s that surround this historic location. If you want to continue this relaxation, surrounded by Geneva’s picturesque atmosphere, perhaps a cocktail at the famous La Verre a Monique, would suffice. Taste the blended uniqueness that the self-proclaimed speakeasy provides, as you flounce in style wearing your best flapper dress and brogues. Fondues in Geneva aren’t exclusive for tourists; it is an absolute must for everyone. There are a plethora of restaurants that provide the customer with a pot of cheesey perfection; however, one of the best is Les Armures. Although Les Armures is actually a hotel located in Old Town, it is known for it’s traditional and fantastic fondue. Relax in the traditional building, with low wood-beamed ceilings and exposed brick, as you gorge on your bread dripping with hot, melted cheese. Wash down the taste sensation with impeccably matched vin rouge.